Cunningham, D.L. (Director), Siegel, A. (Producer), LeBoff, J. (Producer), Platt, M. (Producer), Schmidt, R. (Producer). (2007). 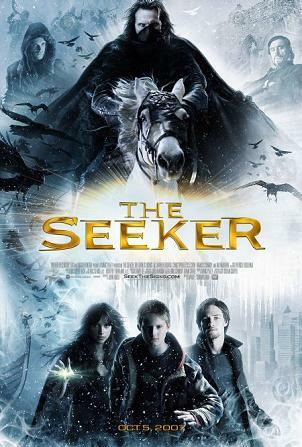 The seeker: The dark is rising [Motion picture]. United States: 20th Century Fox. The Seeker: The Dark is Rising is based on the young adult novel The Dark is Rising by Susan Cooper and stars Alexander Ludwig most recently known for his roles as Cato in The Hunger Games and Seth in Race to Witch Mountain. The story follows Will Staton, the seventh son of a seventh son immediately after his fourteenth birthday in which he learns he is the most important person in the fight between the light and the dark as the Old Ones introduce him to his destiny with only five days to search for six signs hidden in space and time by one of his ancestors. These six signs will give either the Rider of the Dark the power to rule the world, or the Light the power to vanquish the Dark, and it is entirely up to Will to find the power to believe in himself so he can save the world. Will Staton (Alexander Ludwig) the protagonist is assisted in his search for the signs by the Old Ones. The Old Ones that protect and guide him include Merriman Lyon (Ian McShane), Miss Greythorne (Frances Conroy), Dawson (James Cosmo), Old George (Jim Piddock), and Will’s girl crush from his school, Maggie Barnes (Amelia Warner). And the Rider (Christopher Eccleston) of the Dark, the antagonist is disguised as the village doctor. Though the film was not as popular with many fans of The Dark is Rising Sequence from the 1970’s due to significant differences in characters and plot, the movie is undoubtedly enjoyable due to the suspense, action, popular cast, and visual effects. Those who enjoyed the films Harry Potter and the Sorcerer’s Stone and Inkheart both based of the books with the same title, or the television series Legend of the Seeker based off of the adult fantasy series, The Sword of Truth by Terry Goodkind should easily find The Seeker: The Dark is Rising highly entertaining.